Early in his cinematic career, Arnold Schwarzenegger headlined two films based on Robert E. Howard’s Conan the Barbarian. Around the same time, Marvel’s Conan comic book series was still an ongoing hit. The Conan franchise returned to Marvel earlier this year, with a relaunched series by Jason Aaron and artist Mahmud Asrar. Aaron and Asrar’s first issue teased Conan’s origin and his future as the King of Aquilonia, while also hinting at his demise. Schwarzenegger posted a video on his twitter account that shared his appreciation for the new Conan comic. He even mimicked one of Asrar’s panels before revealing the variant cover featuring his likeness. As noted by Schwarzenegger himself, the Conan the Barbarian #1 photo cover can be found on ConanComic.com. Schwarzenegger hasn’t hidden his desire to return to the role after 35 years. Previously, Schwarzenegger was attached to Conan the Conqueror, a film that would have explored Conan’s time as king. While that project has failed to materialize, Schwarzenegger used the video as another opportunity to pitch it to fans. Conan the Barbarian‘s immediate live-action future will unfold on Amazon Prime. Colony co-creator Ryan Condal is shepherding the Conan TV series, but the show has yet to cast its lead character or start production. 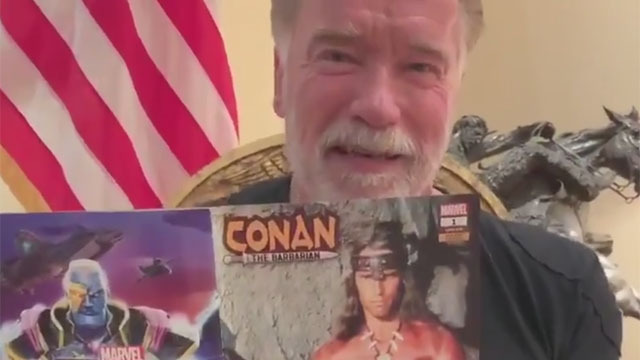 What do you think about Schwarzenegger’s endorsement of Conan the Barbarian #1? Do you want to see Schwarzenegger in a new King Conan movie? Let us know in the comment section below!